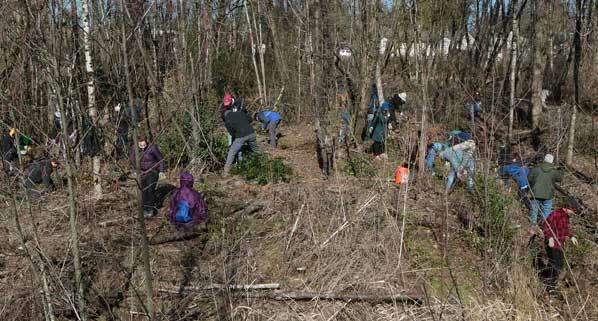 Large groups of volunteers work together to install native plants and remove invasive species during the Johnson Creek Watershed Council Watershed Wide Event. Portland Parks & Recreation Stewardship Manager for the Johnson Creek Watershed Susan Hawes advises volunteers about planting native species during the Watershed Wide Event. 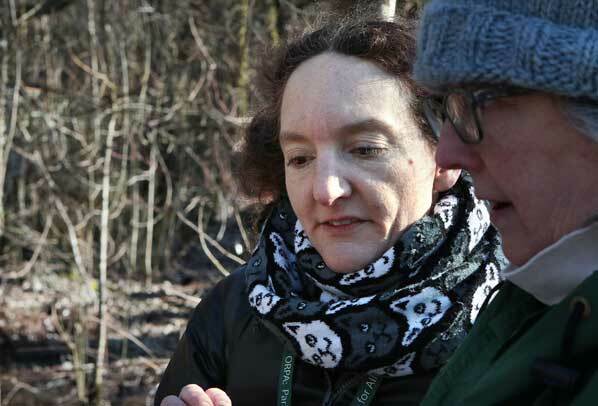 “Partnering with the JCWC on projects such as the ‘Watershed Wide Event’ is really important to us at Portland Parks & Recreation, because it involves so many people in the community,” remarked the Bureau’s Stewardship Manager for the Johnson Creek Watershed, Susan Hawes, as she helped out at one of the sites. 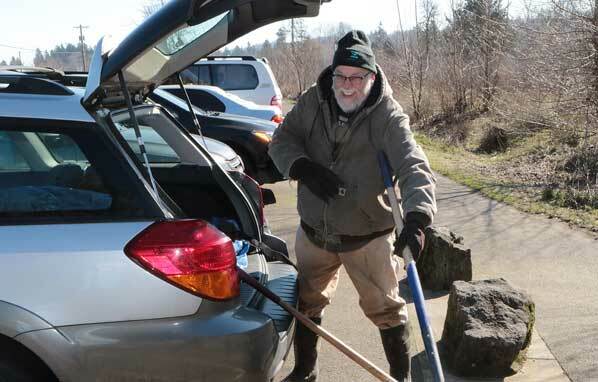 “For our Bureau, it’s all about getting people engaged in, and connected with, their local parks and natural areas,” Hawes told East Portland News. 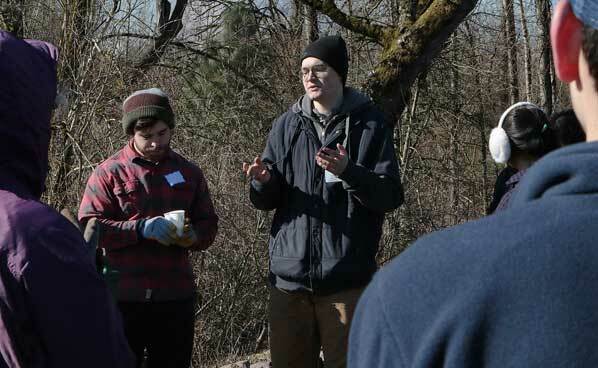 At the Freeway Lands site in the Lents neighborhood, JCWC Outreach Specialist Jack Halsey, and Confluence/AmeriCorps member gives volunteers planting instructions. Two of the larger groups worked at two outer East Portland locations. One was in the Lents neighborhood, in the Foster Road floodplain area of Freeway Lands; the other was on the southeast edge of the Powellhurst-Gilbert neighborhood. At Freeway Lands, about 50 volunteers so efficiently planted their allotment of seedlings during the first hour, the crew then had time to switch to installing native plants there. 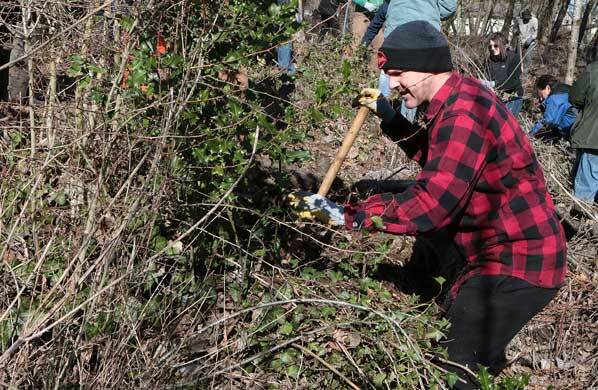 –Putting his back into it, here digging out an invasive holly tree is “lifelong Lents neighbor” Brandon Walker. Their work completed, these volunteers from the SE 145th Avenue site head back to the base camp. 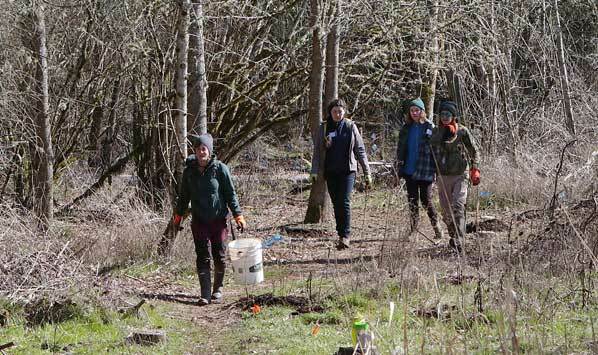 With about 40 volunteers just east of SE 145th Avenue, north of the Springwater Corridor Trail, another group quickly completed their planting and restoration efforts. “It’s beautiful to see people gathering together to care for the creek and each other during our events all year long, smiled JCWC Volunteer Coordinator Courtney Bektel, coming back from a worksite. After the morning’s work is done, volunteer Bill Cepurna stows gear, ready to return it to JCWC headquarters. Find out how you can get involved with the Johnson Creek Watershed Council – they host events almost every weekend – by visiting their website: CLICK HERE.